Oh my gosh, and it's gorgeous!!! I love your triangles. That's going to be fantastic on your bed! 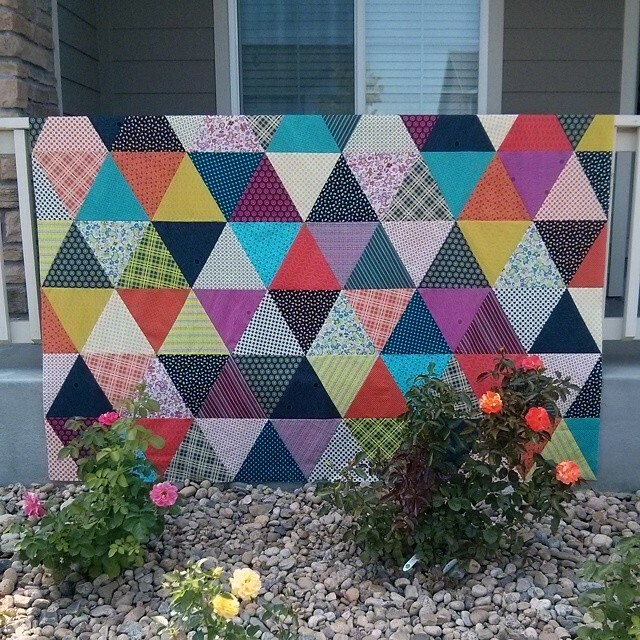 I agree, this quilt is a beauty! Absolutely gorgeous!! What size triangles did you use? Each edge of the triangles is 11" finished. I knew I wanted them to be large, and I picked the final size in order to optimize what I could get from the fat quarters that I had. for your bed, yay!! chicopee is such a great color line - love! i have really been only working on my piles for about a year now, and it is so fun to get things done! and once you focus on them instead of 'new, shiny', i find it very easy to enjoy the initial excitement of that plan again - it's all a matter of focus, really, and remembering what you loved about it to begin with - and the finishing is so sweet! and 26 boards - yowza! I agree, once it started coming together it was more exciting again. And the finish will be extra satisfying as it not only will be a quilt I enjoy, but also ticks an item off my list of piles. I am definitely a list-maker at heart - somehow just crossing that off is satisfying in itself lol. Its a joy seeing you finally creating a piece for yourself. The beautiful colors and prints are definitely you. Super job! Nice website. Thanks for share it.